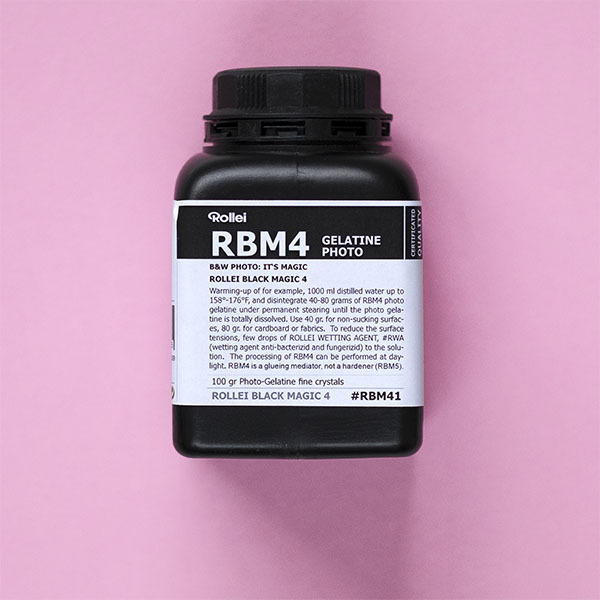 Rollei Black Magic Gelatine 100g RBM4. For use with photographic emulsions, such as Rollei Black Magic VC. Also suitable for use with other brands of emulsion. When you use photographic emulsion you can apply it to virtually any surface imaginable. If the surface is very porous or very smooth we would recommend a coat of Gelatine. Mix the gelatine with water to create a solution that you can then apply to your print surface. Once dry, proceed as normal to coat your paper in the darkroom. It is fine to handle gelatine in daylight when you coat the paper. Only the emulsion must be handled under safelight in a darkroom.